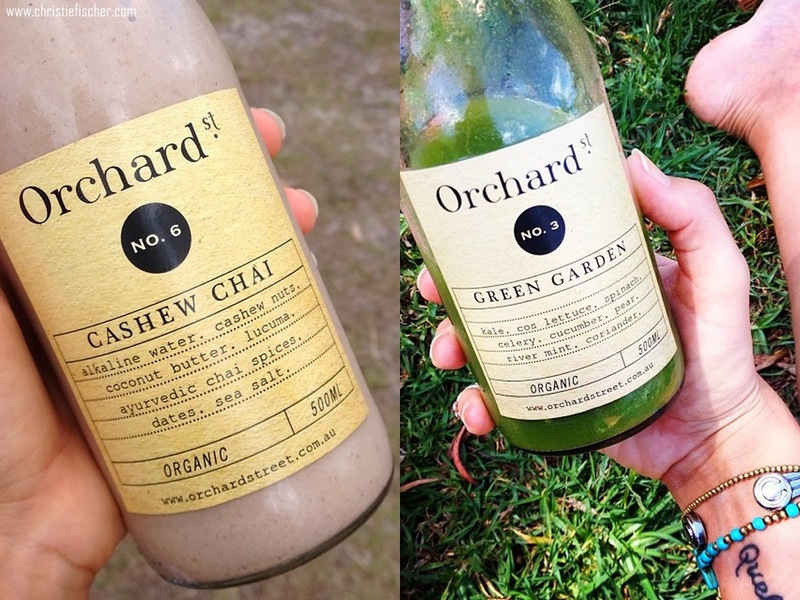 I first found out about Orchard St through social media – their colourful pics of juices, beaches, Sydney surrounds and places afar, as well as seeing their organic juices (in glass jars!) pop up on the Insta accounts of numerous foodie and health people I follow – I was hooked on the stuff without even trying it! I kid you not, I was seeing it everywhere, and like any great marketing, I had to have some. So on my trip to Sydney I was so excited I’d get the chance! So I ordered a 1-Day cleanse as we weren’t ever anywhere long enough to order much more without giving Orchard St three separate addresses to deliver too. then address details, payment, and delivery. Done. Now to eagerly await your colourful babies! It was not long after 5pm that the Orchard St delivery van pulled up and I was as excited as a kid in a lolly shop! The guy was super friendly, and I felt so special getting my juices AND a hessian bag with gorgeously printed cleansing info, additional tips and tricks, a lemon, and a bunch of straws. I was sold on the bag alone. This was a shared brekkie in the car between B and I as we left Sydney and headed north to Byron. YUUHM! mid freeway 110km/hour at 630am. Initially I wasn’t sure if I’d like this going on the ingredients alone but it was probably one of the best green smoothies I've ever had. Consistency, texture, taste. It was all spot on. I have to say I’m a kombucha girl over Kefir but this was pretty good. I still didn’t love it but that’s just my preference. The tumeric was strong and powerful (how I like it), and the rest was just perfect. No cayenne flavour in sight either! But still, I'll take kombucha first anyday (and do - everyday). This was my pick-me-up at a Stop. Revive. Survive place and I drank it whilst grounding my feet, and then doing a few ab moves and 10 pushups… then back into the car. This was super refreshing, light in my mouth, and had every cell in my body jumping for joy that such good nutrition was coming in. No word of a lie. As you'd expect - a delicious, refreshing and earthy juice. Not quite a juice or a smoothie, this was more like an iced tea, and sooooo delicious. I’m actually going to try and recreate this one at home for myself. Perfect after a day at the beach. I had high hopes for this having heard through social media that this one is most people’s favourite – whether that’s because after a day of juices this is satisfyingly filling, or because it feels naughty after green juices (but isn’t), or simply because it’s just so darn tasty – who knows why. Now I know the name kinda gives it away but I think my tastebuds were still expecting a ‘plain’ cashew milk smoothie coz they were blown away by the chai flavour – and like I said, I knew it was in there. This was smooth but creamy, flavour-some but not overly sweet, deliciously satisfying, but perhaps too much for just me – a few people got sips of this one. Organic + Cold pressed + Glass bottles = Winner!! I would most definately order this cleanse again, but I'd go all out and grab me a 3-Day Cleanse to really get the benefits of these amazing organic ingredients. I love the fact that only organic is used and that there are different juices in the cleanse - such as the tumeric kefir and rosella tea. And bottling in glass? I am so in love with this, and so happy that more and more people are now doing this. Having bought this cleanse in Sydney, I was happy to know it was made in Sydney. Orchard St now deliver to Melbourne and a few other places interstate as well (I believe), but personally, I'd rather buy local juices if I was outside of Sydney, but that's just my preference. Thank you to Kirsten Shanks, the qualified Naturopath, Nutritionist and Herbalist behind Orchard St, who made it possible for me to try her juices. With a love of nature, a passion for healing and a strong belief in the use of food as medicine, Kirsten was inspired to develop her brand Orchard Street. And anyone who has tried her juices, is no doubt, extremely grateful. Get your own Orchard St Cleanse and be sure to check them out on Instagram for some seriously delicious juice inspiration.